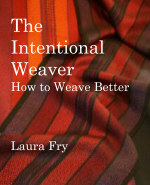 Once again weaving has administered a reality check - nope, still not perfect. After working on The Book for so many (cumulative) months, I am just about at the point where I am so *done* with it. If it weren't for the fact Ruth is here, right now, polishing, polishing, polishing, it would be so very easy to just toss it all and say I just don wanna any more. But I am also so close I can taste it. My ego has been taking a kicking though, as I look through my samples, weave more, discover that over and over again I am so far from 'perfect' it isn't even funny. A big part of me wants to write the 'perfect' book that everyone will find helpful, useful, a'classic' of the literature. Another part of me knows very well that that is an insanely ridiculous thing to even think of. Of course all of this isn't helped by a loom that isn't behaving very well, introducing 'errors' into the cloth that are nearly impossible to see...until after wet finishing. Yes, there is enough warp left I could re-do it. On the other hand, some judicious cropping will make those mistakes invisible. In the end it isn't perfection that is important. It is the sharing of knowledge. And even imperfect samples can still convey concepts and solid technical information. So I'm not going to re-weave the sample. And I'm going to practice being ok with that decision.